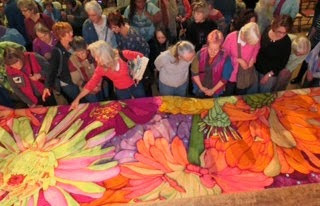 Speaker Velda Newman's award winning quilt, Zinnia, (88" X 211") is admired at a recent EBHQ meeting. Sashiko, a form of Japanese folk embroidery based on the basic running stitch, originated in Japan's northeastern Tōhoku region as a practical method to darn textiles such as insulated layered clothing and cloths used to wrap and carry. It is now celebrated for its simple aesthetic—its simple graphic motifs often build to create complex compositions with varied symbolic and historical meanings and can also express regional identities and personal aesthetics within a community. Esteemed textile scholar Yoshiko I. Wada will discuss sashiko’s specificities and the phenomenon of its global spread, drawing connections between this folk craft elevated to art and the work of untrained artists at Nui Project, operated by the Shobu Gakuen Social Welfare Facility in southern Japan. Through meditative, time-consuming processes, these stitchers from the North and South find a commonality of self-healing and personal expression where the artist transforms the stitchery and the stitchery transforms the artist. Roderick Kiracofe is a local (San Francisco) author of Unconventional & Unexpected: American Quilts Below the Radar 1950-2000 and other titles; quilt collector; artist, consultant; and all-around quilting community treasure. With his lecture, Unconventional & Unexpected Quilts, you’ll discover, appreciate, and see in new ways quilts you thought were "ugly"—those that are not perfectly pieced, have loads of printed fabrics, are not square, have no recognizable pattern, and possibly even made of polyester double-knit fabrics. They may even resemble modern and contemporary art. Or come and jeer and hiss at them and tell me I'm crazy. Either way, we will have a fun evening. Denise Labadie Snell creates art quilt portraits of luminescent old souls—megalithic stones and monoliths (and newer – though still centuries old – monastic ruins, passageways, and portals). Using her almost three decade “stone” art quilt portfolio as a guide, Denise will discuss her approach to creating an internationally-recognized body of work that specifically focuses on these ageless structures, visually telling their remarkable stories, developing a unique and memorable style, melding art and craftsmanship to catalyze creative and intuitive expression, and delivering “artistic soulfulness”.